One of the hardest parts of moving to Bulgaria has been leaving our dogs behind. Sure, we had Houndsome with us and he was a barrel of laughs. 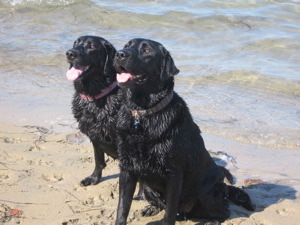 But we also have two other, sweet, sweet black Labs that we left with friends and family. 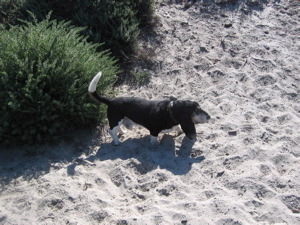 One of our dogs–our girl, Lola–was living with another dog which was a Lab/Pit Bull mix, Bailey. Bailey has been the greatest dog for years, but something happened when Lola came around. He went crazy and tried to eat her twice. We tried everything, separating them, supervising them, training them, but the first chance he got, he tried to eat her for dinner. After the second time, Bailey’s owners worried about him going crazy around children, and upon the vet’s advice, ended up putting him to sleep. His Pit Bull self had come out and he probably wasn’t going to go back. Sad, sad, sad. 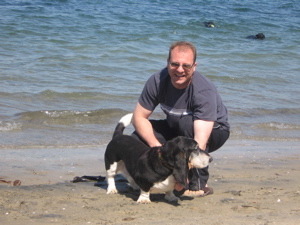 The last time we were home we couldn’t take Lola out swimming or running because she was still healing from her wounds. 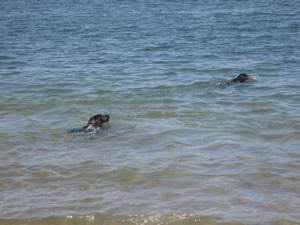 So we were determined to take her, Guiseppe, and our boy Lab (Lola’s father) Dakota to the beach. One sunny, Saturday morning, we drove to all four corners of San Diego County to retrieve all of our dogs. We I was a bit worried about if they would all still get along because they have been separated for 8 months. But, of course, they did! 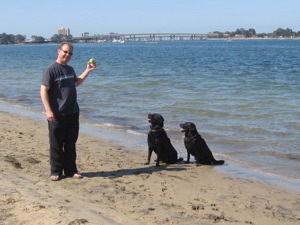 We loaded them into the truck and headed to Fiesta Island, our favorite doggy place to visit. Notice Guiseppe. He refuses to join the action. This is not new for him. Every once in a while he will get a pinky toe wet, but.nothing.more. He chooses instead to guard our section of the beach and should any other dogs come by, they would be subject to his approval. (All dogs eventually get approved, though he must sniff them and follow them a bit first). Lola is our Swimmer Extraordinaire. She will NOT stop unless we stop throwing the ball. In fact, I got a call two days later that she was acting depressed and mopey. No, no, I said. She is just achy, you know, like when you haven’t exercised for a year (say, after foot surgery or something like that) and you H.U.R.T. for days after the first time??? Dakota is our Gentle Giant. He looks big and scary, but he wouldn’t hurt a fly. In fact, Lola drives him crazy, CRAZY, and still he licks her and loves her. 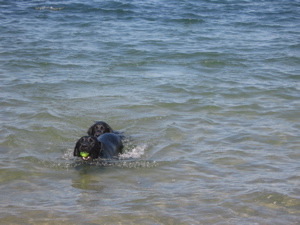 She steals the ball from him every single time he has it, even if he is swimming in the water at the time. After playing with her for a few minutes, he eventually just hands it over to her and gives her a lick. So cute! And so we hung out for the day, then we took them all to the groomers to get a bath and a blow dry (which they LOVE). Then we drove to the four corners of the county and dropped them all off. Fun times. We can’t wait until out reunion is permanent and we can swim with our hounds in our backyard pool everyday!!! Kristy Nicole! Do you remember me? I googled you and found this fabulous website! My oh my have you been a busy lady! What a fun filled life you are leading! I can’t believe that it has been over 15 years since we last spoke! How sad for me, I have missed being a part of your fantastic life! I am so glad to see that you and Mr Mark are together and having adventure after adventure! Hey, please contact me, I would love to re-connect! I just want you to know that I think of you often! Hope to hear from you soon.